Happy Thursday! And happy it is! I love the 2nd Thursday of every month because it's card class with some pretty awesome ladies. And today's class is extra special. One of the ladies that comes to class works on our extended care unit within our hospital and she had mentioned to me last week that the residents were in need of Birthday and Sympathy card and that got me to thinking, what if we did a couple of Birthday card designs and a Sympathy card for our normal total of 3 cards and donate them to the seniors on our long term care unit? In return, class would be free as I would donate the materials and we could spread a little joy...well did these ladies rise to the occasion! Not only have they agreed to do this but some of them have actually made extra cards on their own! Talk about some really awesome people that I am so honored to know and stamp with. 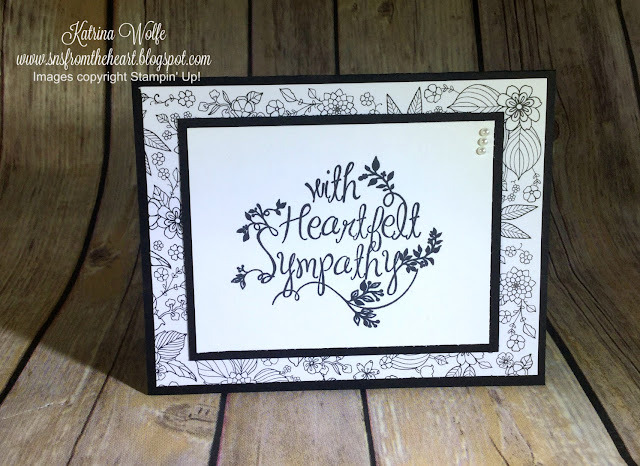 So, today, I am sharing with you the Sympathy card design that I did for this evenings class. It is using the Sale-a-Bration DSP, Inside the Lines. This paper was designed for the purpose of watercoloring with the new watercolor pencils, however, I wanted to show how beautiful it is left in it's natural black and white. And this card does in fact show that. Paper:Basic Black 8 1/2" x 5 1/2" and 4 1/4" x 3 1/4"; Inside the Lines DSP 5 1/4" x 4"; Whisper White 4" x 3"
Adhere the DSP to the card base. Stamp the image onto the Whisper White and layer it onto the Basic Black and attach to the card. 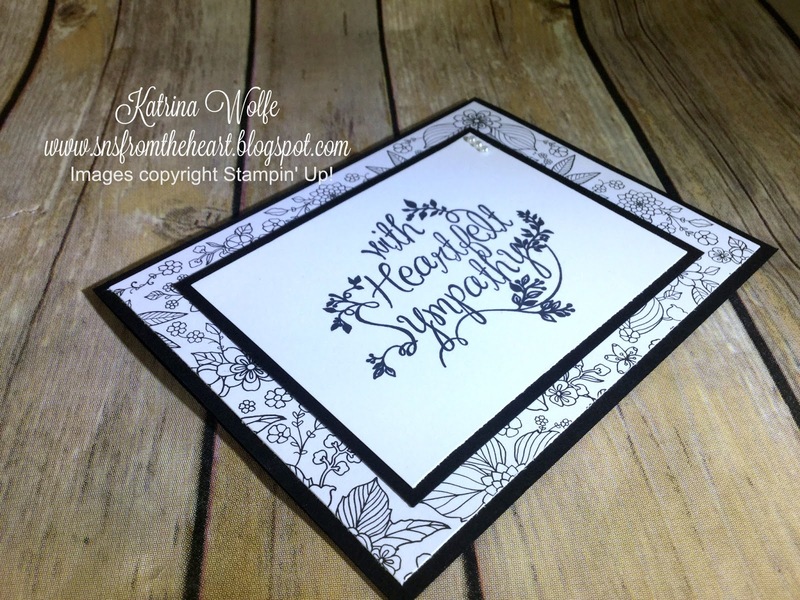 Attach 3 of the tiny pearls to the upper right corner of the stamped Whisper White. Very quick, very simple and very elegant while conveying a most heartfelt sympathy for someone your care for. I hope you liked this card. Its one of those designs you hope you never have to use, but unfortunately we find we need. Please feel free to leave a comment and I wish you all a wonderful day!